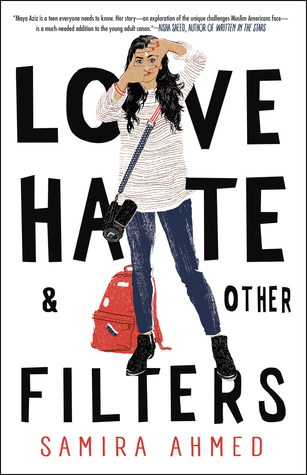 Blurb Description: A searing #OwnVoices coming-of-age debut in which an Indian-American Muslim teen confronts Islamophobia and a reality she can neither explain nor escape--perfect for fans of Angie Thomas, Jacqueline Woodson, and Adam Silvera. I LOVE READING DIVERSE BOOKS that are ALSO #OwnVoices books because not only do these books usually have GREAT rep but I absolutely love learning about different cultures or different people’s experiments with my culture. 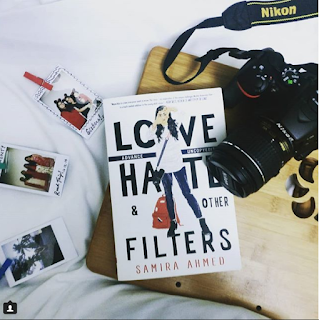 Even before the lovely people at Diverse Book Bridge got me an ARC of Love, Hate and Other Filters, Samira Ahmed’s debut novel was on my radar as one of the books I KNEW I would be reading. An Indian American Muslim teen and her struggles with love, her parents and Islamophobia? SIGN ME UP. 1. If you ask me to describe what most of this book was about, I would simply HAVE to say FLUFF. SO, SO, SO MUCH FLUFF. Love, Hate and other Filters has that insta love triangle where everyone is VANILLA and perfect and so CHEESILY ROMANTIC and claim they ‘know’ each other even though THEY JUST MET and BOTH of the romances honestly did nothing for me. Both boys were SO FLAWLESS that I sat there in disbelief. It was unrealistic and this book should have had LESS ROMANCE. 2. I understood Maya. I understood her NEED to find a place in the world and to do something she loved. I GOT her need for independence and freedom. And yet, by the time I was seventeen, I had LEARNT that it was just better to openly talk to my parents about most things instead of lying to them and shutting up and RUNNING AWAY. I got her, but I also wish she had been more mature. 3. 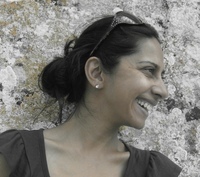 One of my favourite things about this book was Maya’s aunt, Hina. She was a SPECTACULAR character, an independent feminist that didn’t conform to societal (especially desi) pressures and her unwavering support for Maya and her own life was AN INSPIRATION. 4. I couldn’t help but shake the feeling that we didn’t see enough about Islam as a religion or about Muslim Culture. Sure, we got pieces of Indian rep but there were NO religious thoughts or beliefs that we saw from Maya (except the No Pork thing) and that disappointed me. 5. I’m not saying it was BAD that we didn’t see any Muslim rep, I’m only saying that there could have been a LITTLE LESS ROMANCE AND FLUFF AND A LITTLE MORE OF DESI/ MUSLIM CULTURE. 6. These are all LITTLE problems I had with this book. I really really liked it, but with all the hype it’s been getting as a diverse book, I just NEEDED a little more diversity from it than what I got. A beautiful, diverse coming of age story about a girl trying to carve out her own way in the world that I simply wish had less of a romance and more EVERYTHING ELSE. 3.5 Stars. Her writing is represented by Eric Smith of P.S. Literary. What are some of your most anticipated diverse reads of this year? Who are some of your favourite desi characters in literature? Have you had the chance to read Love, Hate and other Filters? What did you think of it?